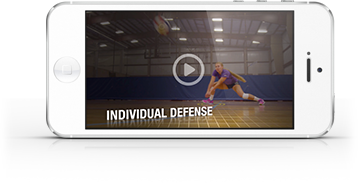 This 6-on-6 drill, introduced by Rice volleyball coach Genny Volpe, works on playing and bettering unpredictable first contacts. Or crazy balls, as she likes to call them. To start play, one team receives a coach-initiated ball after its front row players tap block to simulate an ongoing rally. This ball, which is entered as crazily as the coach wants, counts as the first contact. The team has 2 remaining contacts. The rally is played out normally, and then the coach enters a crazy ball to the other side of the net. The coach determines how many points to play to before starting the drill. Scoring is normal, except if a team sets a hittable ball after the crazy ball and wins the rally, it's worth 2 points instead of 1.